After lots of discussion and throwing ideas around, we finally decided to give this blog an official name instead of our own names. 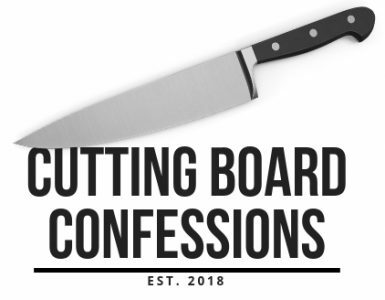 I mean, we have great names, but this blog is more about food and less about us, so we have officially named our blog Cutting Board Confessions. Why you ask? Well, let’s just say that we have lots of cutting boards around our house. Different woods, shapes, etc, and Brian loves to “plate” things up on a cutting board. I’m always totally fine with it because it means less dishes on my end…winning!!!! Now, we haven’t posted anything in a few weeks because life got a little hectic and I, Nalin, was traveling for work a couple weeks back so I wasn’t really home to fully blog about the fabulous creations that Brian was doing while I was away. Let’s be honest, he was living it up on food that I usually am not a fan of eating, and he thoroughly enjoys indulging in those meals while I’m not around. I’m totally ok with it. With the new title it feels like a new start, so I promise to have some new content up here in the next few days. Feel free to drop us an email for any ideas you would like to see on the blog. Simply email us at CuttingBoardConfessions@gmail.com and we will be more than happy to get working on those ideas.